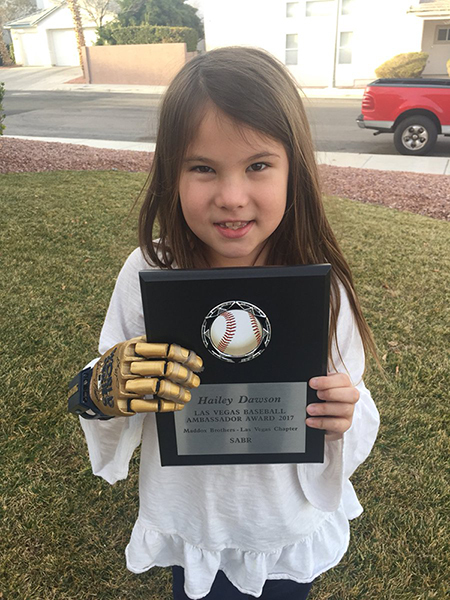 SABR's Maddux Brothers-Las Vegas Chapter honored 7-year-old Hailey Dawson, whose story captivated baseball in 2017 and took her all the way to the World Series, with its inaugural Las Vegas Baseball Ambassador Award recently. Dawson, from Henderson, Nevada, was born without a right pectoral muscle due to a condition called Poland syndrome, resulting in the loss of her three middle fingers and an underdeveloped thumb and pinky finger. An avid baseball fan, she threw out the first pitch before Game Four of the 2017 World Series using a 3D-printed robotic hand developed by engineers at the University of Nevada at Las Vegas. She has set a goal to throw out a first pitch at every major-league stadium. Her quest began in 2015 when she threw out a first pitch before a Baltimore Orioles game at Camden Yards; she was also invited to do the same at a Washington Nationals game last season, when she met her favorite player, Las Vegas native Bryce Harper. SABR chapter leader Rick Swift said the chapter established the award to help promote baseball in the Las Vegas region. This page was last updated February 9, 2018 at 1:01 am MST.